Millennials and Instagram go hand in hand. And Instagram ads exist within the Facebook advertising ecosystem, which means it’s fairly easy to run an Instagram ad campaign when you’re already familiar with Facebook’s backend. Millennials check Instagram throughout the day — starting when they wake up and ending before they go to bed — and engage with content at a significantly high rate. Instagram is hugely engaging, but it functions primarily in a vacuum. Users won’t necessarily be willing to click on a link that takes them outside the app unless some sort of value is added to do so. When building your Instagram ad campaign, focus on how a click will benefit the user and make that incentive clear with your creative. Develop your Instagram strategy as a stand-alone campaign. Much like the Audience Network campaigns, you’ll want to create Instagram campaigns without any other channels selected. Instagram users, though they might be the same people, have different personalities and will engage with content in a different way than Facebook users. Select the option to show your content only on Instagram, as opposed to all options on Facebook. Consider using Instagram for brand awareness. If you do want to use Instagram in a more robust Facebook ad campaign, you can easily use it as a brand recognition and building tool within your Facebook ad campaigns. Keep in mind, however, that it may not lead to many clicks with Millennials if no value is added, but seeing your brand on Instagram can certainly offer an assist in your Facebook campaign. Your content must be clean and eye-catching. Remember that you’re competing for the attention of Millennials who are not all that willing to give you more than a few seconds. Unlike Facebook and Twitter, the written content and call-to-action fall below the image, which means that if your image isn’t captivating, it will be completely ignored. You can avoid this pitfall by creating an ad with text in the image. 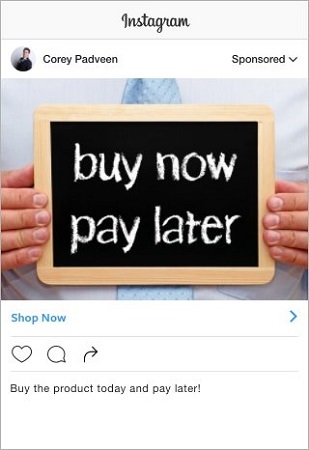 An Instagram ad with text in the image. Instagram allows you to place as much text as you want on an image, unlike Facebook where the image may not be approved or may not show if you have too much text. Try testing samples of images that are calls-to-action themselves and see how your audience responds. But remember that this method won’t always work, and your call-to-action must highlight a value-added if a targeted user clicks on it.